Captain Chesley B. "Sully" Sullenberger (right) speaks with the International Space Station’s Expedition 22 crew while visiting the Mission Control Center at Johnson Space Center in Houston on Jan. 4, 2010. When itcomes to astronauts, NASA is all about safety but the space agency was notabove taking some pointers this week from hero pilot Capt. Chesley ?Sully?Sullenberger, who made headlines when he landed his U.S. Airways passenger jetin New York?s Hudson River last year. Sullenbergerspoke to astronauts and employees of NASA?s Johnson Space Center in Houston at the request of the center?s Safety and Mission Assurance Office. He also got achance to tour the center?s space shuttle flight simulators and speak with astronautsaboard the International Space Station. On Jan. 15,2009, Sullenberger was at the helm of an Airbus A320 that took off from New York City?s La Guardia Airport en route for Charlotte, N.C. The jetliner was carryingfive crewmembers and 150 passengers when it hit a large flockof birds just five minutes after takeoff, damaging the engines and forcingSullenberger to land the plane in the Hudson River. Sullenbergerand his crew have been lauded ever since for their actions, which brought all155 people aboard to safety. Japaneseastronaut Soichi Noguchi told Sullenberger that it was an honor to speak withthe hero pilot from space. ?Weactually watched the news the other day and saw you on the float for the RoseParade,? said Noguchi, who represents the Japan Aerospace Exploration Agency onthe station?s five-man crew.? Sullenbergerwas Grand Marshal of the Rose Parade on Jan. 1 and tossed the opening coinbefore the kickoff of the 96th Rose Bowl game in Pasadena, Calif.
?This hasbeen a real surreal year for us and this is yet another wonderful opportunitythat we thought we?d never have,? 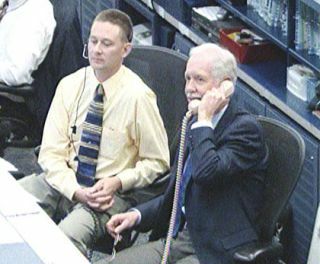 Sullenberger radioed the space station crewfrom Mission Control. Sullenbergermarveled at how astronauts in space can get any work accomplished at all, giventhe viewof Earth 220 miles down below. ?If it wereme, I think I would have my face up against the glass for quite a while andhave a hard time doing any usable work,? he told the astronauts, who thankedhim for his service and praise. During histalk at NASA, Sullenberger attributed the safe landing of his crew andpassengers on that fateful day last year to proper training, communication anda steadfast belief in each other. Safety, he added, plays a role in every cultureand hinges on individuals acting with integrity. Sullenbergeradded that the American space program has a special place in his heart, onethat dates back to his childhood. ?My fatherlet me stay home from school and watch the Mercuryflights,? he said. ?I have a great appreciation for what NASA does, butit?s amazing to me now to know the lengths I had to go to get an invitation tospeak here. ?